A quarterback in high school, Bakken played defensive back in addition to placekicking in college. He was chosen by the Los Angeles Rams in the seventh round of the 1962 NFL draft, was waived prior to the season, and picked up by the Cardinals. 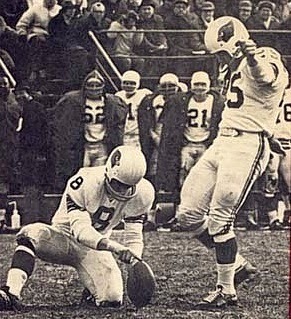 Bakken saw some action in the defensive backfield and missed his only field goal attempt, but he became the team’s placekicker in ’63 and was successful on 11 of 21 field goal attempts and all 44 of his extra points. Cardinals went 9-3-2 to finish second in the NFL Eastern Conference. Bakken went on to kick for another 15 seasons, all with the Cardinals. He was chosen to the Pro Bowl in 1965 after leading the NFL in field goal percentage (67.7) as he connected on 21 of 31 attempts. Bakken led the league in number of field goals (a career-high 27), field goal percentage (69.2), and scoring (117 points) in 1967, a year in which he set a single-game record with 7 field goals in 9 attempts against the Steelers, and received first-team All-Eastern Conference honors from The Sporting News as well as again being selected for the Pro Bowl. He remained a steady performer, only twice dropping below a field goal percentage of 60 between 1967 and ’77 and remaining effective in his mid-thirties after the goal posts were moved to the back of the end zone in 1974. He was a consensus first-team All-NFL selection in 1975 and ’76, connecting on career-highs of 79.2 and 74.1 percent of his field goal attempts, respectively. Bakken’s performance finally dropped off in 1977 and ’78, his last two seasons. At the time of his retirement, he ranked second in NFL history in scoring (1380 points) and was tied for third in career field goals (282) with his contemporary, Fred Cox. His overall field goal percentage was 63.1. He also ranked third all-time in extra points (534, out of 553 attempts). Bakken was twice a consensus first-team All-NFL selection and was chosen to the Pro Bowl four times. One of the best of the old-school straight-ahead placekickers, he was chosen to the All-1960s team by the Pro Football Hall of Fame and was a second-team selection for the ‘70s.